This wine had the place smelling like Christmas for a week. Can I give you a tasting note from broken bottle? 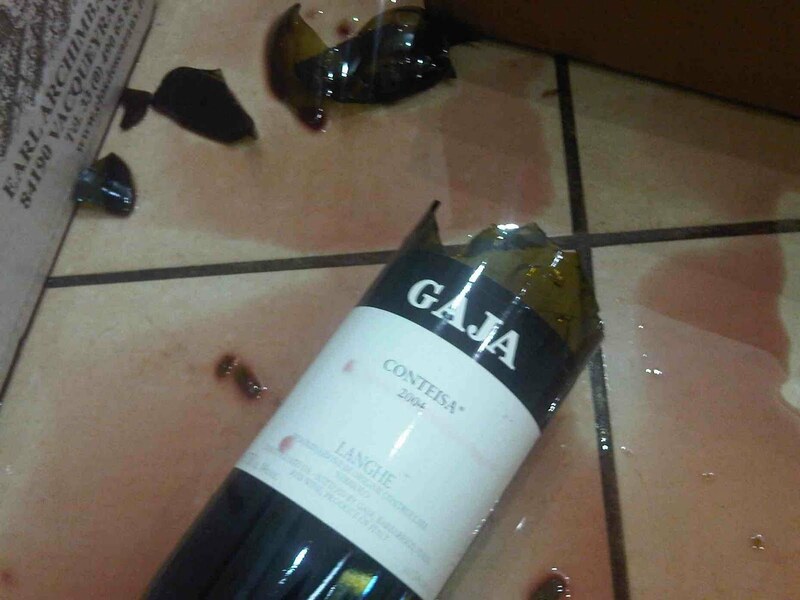 At around £120 – £140 per bottle, I have to at least try… I was down on my hands and knees licking the floor. Risking shards of glass in my tongue just to have a taste. Excellent colour for a Barolo, pale rose colour, it hardly stained the floor… Spice and pine, leather, cinnamon and cloves, if only Gaja could make a “2004 Conteisa Room Deodoriser”. A very expensive way to give a place ambience, but I am sure it would be a great success: everyone commented how wonderful the place smelled. My goodness, that picture is worth a thousand sad words. I’m so sorry.